Today, my wonderful mail lady brought me 3 boxes of Breyers. 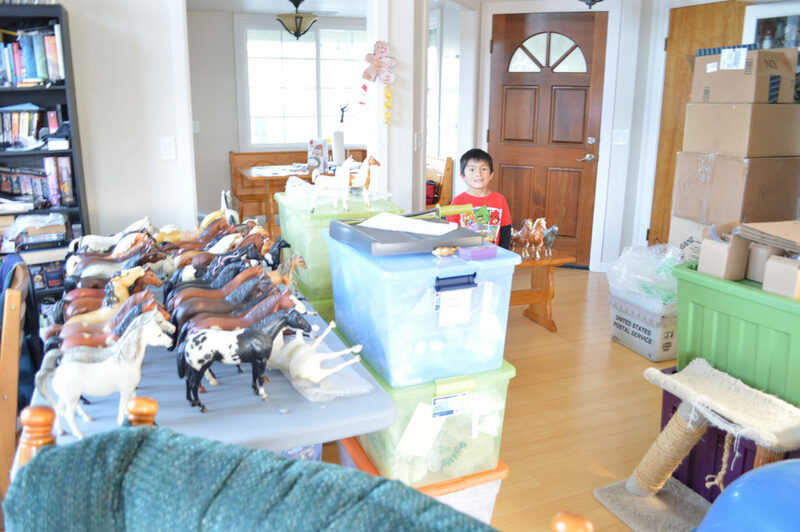 Inside was a collection of approximately 30 horses. They were beautifully wrapped and over all were in nice condition. I was however, disappointed to find that one had lost part of an ear in transit and I could not locate the piece. This horse, in my opinion, was the highlight of the collection. Now I need to decide what to do. I am happy with the horses and the price was good so I may just thank the seller and continue on with business as normal. Yesterday, I managed to clear out the entry way to the house. Today, it is once again filled with boxes. The horses on the table are being cleaned and slated to go up for sale next. 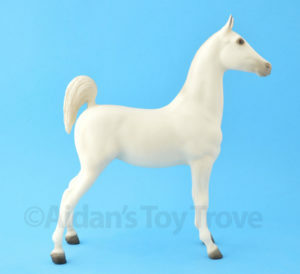 I just listed a beautiful Breyer Saddlebred Weanling in Alabaster to Ebay. I was tempted to keep this one for myself but I promised myself that I would sell 99% of my recently acquired Breyers so here she is, take a look!